I have a 1991 Volvo 740. When it's idling it shakes heavily and now it has started making a popping noise when I drive. I bought it for three hundred bucks and would really like it to last as long as possible. What should be my first plan of attack in trying to find the problem. popping like backfiring? or popping like metal-on-metal clank of something hitting ? i'd probably start by pulling all 4 spark plugs and inspecting them, if one is significantly different color than the others, something is funky in that cylinder, they all should be grey or light brown. if a bad plug, run a compression test on all 4 cylinders too. 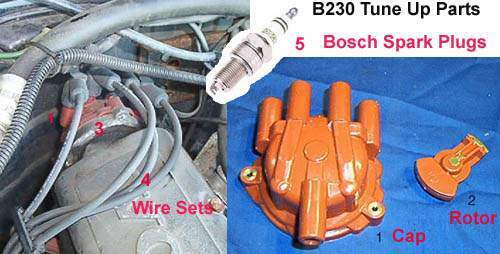 pull the distributor cap and inspect the cap and rotor for excess electrode erosion and/or carbon tracking, replace with genuine bosch only. run the engine when its completely dark with the hood open, and look for signs of arcing around the spark plug and coil wiring. check the OBD1 diagnostic block for any codes on pin 2 (fuel injection) or 6 (ignition). check the ignition timing with a timing light (there's no adjustment, but if its way off, its possible the timing belt has slipped a tooth). Wow great advise, I really appreciate it. Poping like backfiring. This is gonna sound crazy but I bought it without a distributor cap, not sure how they forgot to put it on. Would that definitely be the problem? I'm just waiting to get paid to get the cap. the engine flat wouldn't run at all without a distributor cap, the spark plugs wouldn't be connected to anything. backfiring is a sign of exhaust leak and/or engine running too rich. Maybe its the rotor cap if that's a thing that's missing. what would make the engine run too rich? the rotor is a piece thats inside/under the cap, the engine flat out won't run without both of them properly installed and connected. What should I use to clean my idle air valve? take it off the car, and clean it with throttle body cleaner spray. it can be handy to jumper 12V to it from a small battery while messing with it, to ensure the 'flap' inside opens/closes briskly. odds are pretty good you'll want to get and use new IAV hoses when you reinstall it, as the original hoses are quite likely hard and brittle. Check yer rubber hoses in the engine compartment. I had to change two that went from the throttle body to the charcoal canister near the battery, and it was stalling/surging. I also cleaned out the idle air vale. Use carb cleaner. Spray out the throttle body as well. Check all hoses. 27 year old hoses will need changing. Might do your heater hoses as well (see my post -740 head gasket-, turned out to be heater hose.). All other advice sounds good, need your cap and rotor for the engine to run. where is the best place to get new hoses? Is there a kit of any kind to get all new hoses. What size were the ones that go from the throttle body to the charcoal canister? Thanks again to everyone who has helped me. this website is really amazing. There is no hose kit per say. Some places have some of the heater hoses (FCP, IDPUSA). You can go to NAPA or any auto parts store and buy hose buy the foot. Best bet is to take a piece of the hose you need to change with you to match up as close as possible. I say this because the stock hoses are metric and most auto parts only carry standard.I did not even try to look up replacement factory hoses for the ones going to the charcoal canister. Spent about 6 bucks on a few feet of stock hose. I can't remember the size, small stuff, 3/32" or 3/8" . I would do the same for your sisters car. Bring that piece in to the car parts store and get a piece that will work. They might even give you a 3" length like that for free. Or see if it is the same as what you need for the charcoal canister hose and just get a little extra. my power steering rack started leaking. Is there a way to fix it without buying a whole new one? this thread has drifted pretty far from 'idle problems'. it depends on where the power steering rack is leaking, I guess. usually its the hoses that leak, you fix that by replacing the hoses.